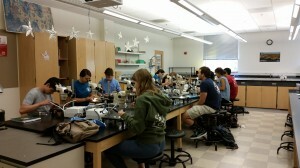 My first look under the dissecting microscope at a caprellid amphipod was alarming, to say the least. Enormous Claw-like mouthparts and red eyes stared straight back at me and I jumped back in my seat. Lucky for me, no one was there to observe my visceral reaction to this strange looking animal. After taking a moment, I knew that I would need to get comfortable looking at these odd creatures since we would be performing lots of species identifications during the course of the ZEN class at UCD, so I gave it another look under the scope. Despite the permanent menacing stare, this caprellid was not so scary, albeit a bit bizarre. I noticed a deadly looking spike behind its head and paused before learning that this protuberance is a defining characteristic of this caprellid species—Caprella californica! After observing this caprellid’s scythe-like claws, I wondered what they were used for. As it turns out, caprellids are pretty clingy. They use their claws (gnathopods) and their legs (pereopods) to hang onto seagrass leaves and algae as they either graze the epiphytes that grow on top of the leaves or filter particles out of the water. Some caprellids can actually help seagrasses grow by cleaning the seagrass leaves and increasing their light exposure, increasing their growth. I guess caprellids would make good housekeepers, since they’re constantly cleaning off dirty surfaces. Out in the field, I had the opportunity to watch caprellids swim. I wondered how these stick figures managed to get around. Through close observation, I noticed that they do a lot of crawling – which makes sense because they don’t appear to have pronounced flippers or large paddles. When they are not clinging to a surface or crawling they get around by moving like a wave. They curl up their bodies then push their feet and head back at the same time, over and over. It is pretty surprising to see what they manage to do with a body plan I’d consider adverse to swimming. After doing a little research, I found out that some caprellids have hairs on their antennae – called swimming setae – that help them get around (Caine 1979). Although some can swim, they don’t swim very well nor do they swim for very long. 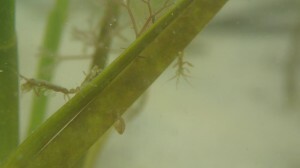 If they’re living in beds of seagrass, all they would really need to be able to do is to hop to get from leaf to leaf. Learning more about what caprellids do for a living has helped me appreciate them, and they just might now be my favorite inhabitants of seagrass beds! For more information, check out: Caine E.A. Functions of Swimming Setae within Caprellid Amphipods (Crustacea). 1979. Biological Bulletin 156:169-178.